A novelty at Tucson 2016. Flattened radial Lautite growths, with a good length for this rare sulphoarsenide. 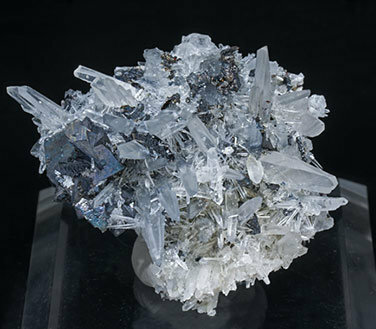 They are implanted on the faces of very sharp Tetrahedrite-Tennantite crystals with an octahedral shape, on matrix and with Quartz, Pyrite and small flattened Hübnerite crystals. A novelty at Tucson 2016. Flattened Lautite crystals with a good size for this rare sulphoarsenide. 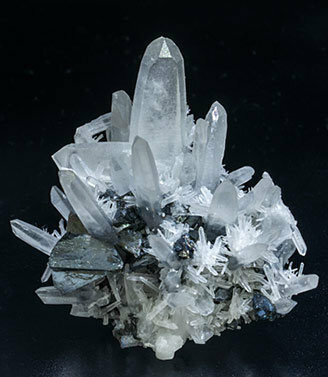 These aggregates have grown implanted on very sharp tetrahedral Tetrahedrite crystals on a matrix of Quartz crystals, some of them with a very well defined Japan law twin. A novelty at Tucson 2016. Very well defined Lautite crystals and radial growths, with a considerable length for this rare sulphoarsenide. They are implanted on the faces of very sharp Tetrahedrite-Tennantite crystals. 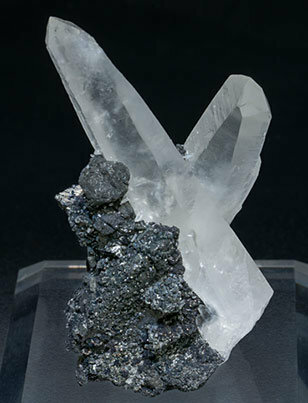 On matrix, with Quartz and Pyrite.